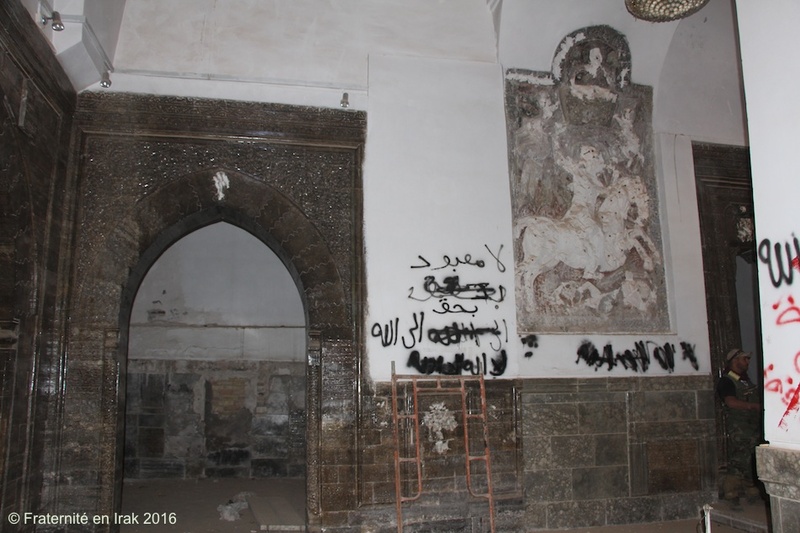 TESTIMONY – On November 23, 2016, Fraternity in Iraq was able to visit the Mar Behnam Convent for the first time since it was liberated. ISIS had occupied it since June 12, 2014. The association knew the site very well as it had had several occasions to visit it before the jihadists arrived ; going back was both a joy and a shock. Here is the story. On Sunday, November 20, 2016 the Iraqi Army announced it had liberated the Mar Behnam Convent, located in Khidr-Basatlia village, about 8 miles south west of Qaraqosh. However, it is only on Tuesday, November 22 that the 9th Division of the Iraqi Army, supported by elements of popular rallying, regained full control over the village and the roads leading to it. On the road to Khidr-Basatlia. ISIS’ recent presence is visible. Fraternity in Iraq at Mar Benham in 2011. 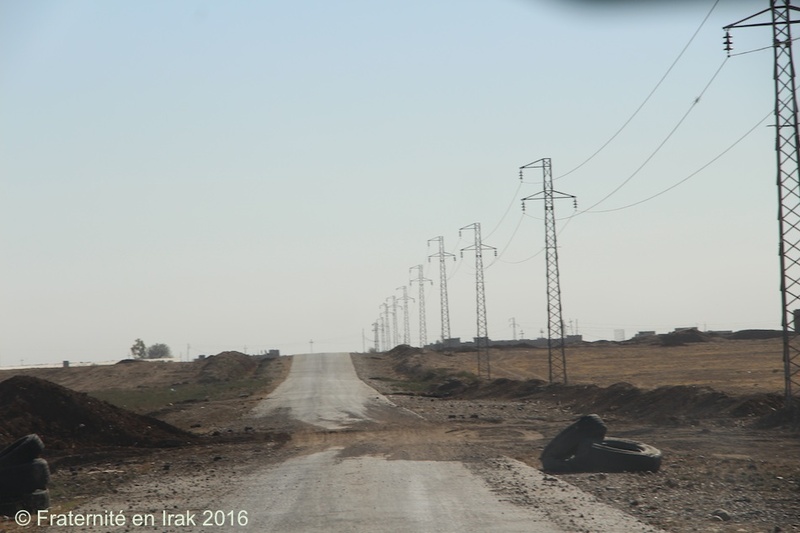 On the road leading to Khidr-Basatlia, ISIS’ recent presence is still visible. Tires are aligned on each side of the road : the jihadists had to leave before they could set them on fire. Further away, a mined car lies on its side. The jihadists had even cut the road with a deep ditch that the Iraqi Army already filled. The three villages we pass, sunnite and shabak, are empty but patrolled by a large number of soldiers from popular rallying and the Iraqi Army. As soon as we enter Khidr-Basatlia village, we breathe a deep sigh of relief as we see the convent buildings. They are still standing. The entrance proch is protected by several armored vehicles. It has been covered in spray-painted graffiti. 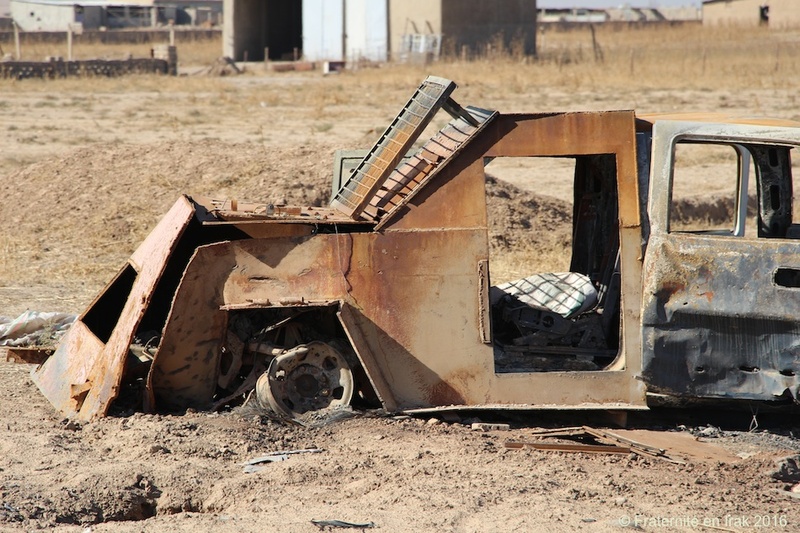 Those made by ISIS soliders were covered by the Iraqi Army. Once in the courtyard, the emptiness comes as a shock, and draws attention : the dome and mausoleum building are no longer here. We knew ISIS had blown it up, but seeing it is a real shock. Guided by Mgr. Pios Affas, episcopal vicar of the Catholic Syriac diocesis of Mossul-Qaraqosh, we immediately approach the destructed mausoleum. After checking that the surroundings aren’t mined, we reach the crater left by the explosion. Here, surrounded by many soldiers, Mgr. Pios Affas launches into Mar Benham’s dedicated hymn, in Syriac – then joined by all for the « Our Father » prayer. 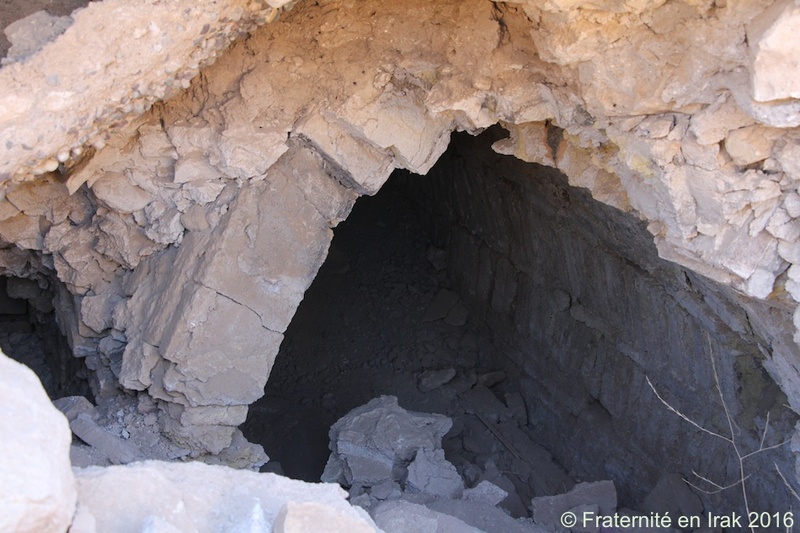 We then start to look into the damage : the blast has clearly destroyed the two tunnels leading to the mausoleum. General Behnam Aboush, who leads the Christian Militia of the Nineveh Protection Unit (NPU), goes down the rubble for a closer look. The Mar Behnam Mausoleum is deeply burried and could only be accessed by two tunnels. It is hard to see what is destroyed and what is burried. 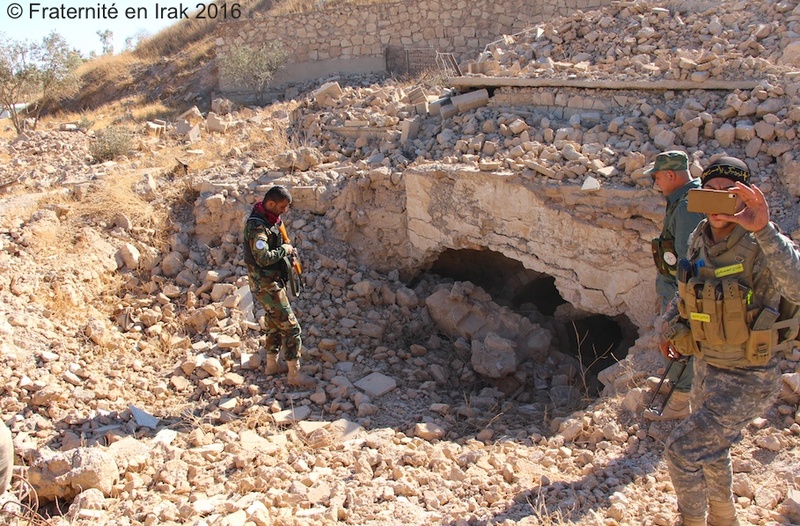 An Iraqi soldier explains that some of the rubble have probably been mined. 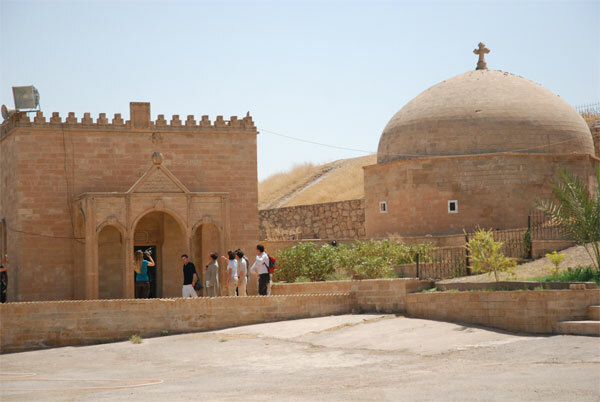 After this first assessment, we reach the Convent church, jewel of the Christian medieval art in Iraq. The symbol of Fraternity in Iraq was inspired by an interlaced cross that was on the walls. As we enter, we feel anger and sadness. The scope of the vandalizing is dreadful. All sculptures showing a cross or human or animal shapes were methodically hammered. A tympanum, entirely carved, unique in the world, composed of stones nested one into another, was disfigured. Everywhere, white marks are as many signs of this demolition work. We look for elements we remember : the discrete Ethiopian cross carved on a door mount was destroyed. On the lintel, we look for the cross that has become the symbol of Fraternity in Iraq : it has also disappeared. Higher, the arms of a huge oriental cross were cut. In the center, the head of a lion was erased, and on another lintel a sculpture of two peacocks was also destroyed. A statue of Mar Behnam on his horse, which dated back to the 16th century, was knocked down. Opposite, his sister Sara’s statue, a martyr herself like him, was demolished as well. We move toward the most ornated sculpted door, where an interlaced calligraphy of the « Our Father » prayer in Aramean was next to a picture of praying monks – which could also be seen as a calligraphy of the word « Aloho » (God in Aramean). Alas, all these sculptures were vandalized. Together with Mgr. Pios Affas, we run to see if the other jewel of this sanctuary has remained intact: the chapel of the Virgin. 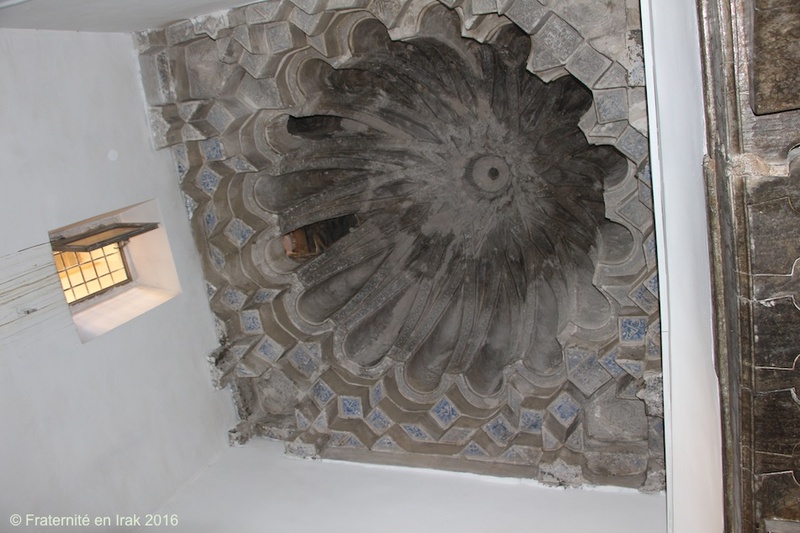 We raise our eyes and, oh joy, the jihadists haven’t touched the sublime vaulted ceilings dating back to the 12th century. These domes, which display prayers to Mary, rise toward the sky : their beauty seems to have defeated the destructive relentlessness of ISIS soldiers. Fortunately, the altars are intact and the baptistery, carved in one piece in the stone, hasn’t been broken. The side chapels are almost untouched. The inside framings of the entrance doors are also in relatively good shape. Once outside, we pull away to assess the frontage. Before, you could see a large « Our Father » and a « Hail Mary » together with two sculptures of Mar Behnam and Saint Sara. There is nothing left of this. Even the ridge cross was smashed. Further away, in the courtyard of the conventual buildings, a big pile of ashes is evidence of ISIS’ autodafe : a few pages of a song book and an embroidery of the Virgin lie on the ground, sole survivors of the fire. 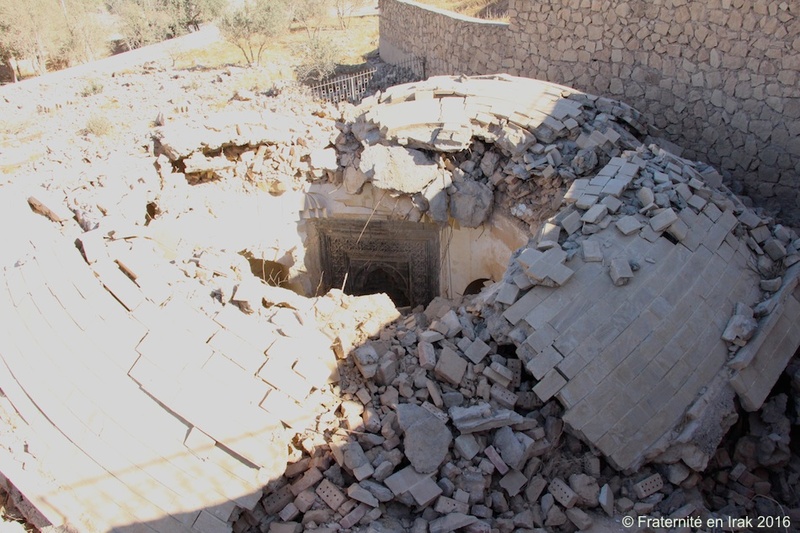 Has Mar Behnam’s Mausoleum been destroyed ? Each and every one of us is worried : earlier, as we approached the mausoleum, we couldn’t confirm whether it had been destroyed or not. We decide to climb on the antique embankment that overlooks the mausoleum. There, carefully, as we dread possible landmines, we manage to catch sight of a lintel surfacing the rubble. We get closer and are filled with wonder : three quartes of the mausoleum seems intact. That means it wasn’t blown up as we feared : what a great relief ! Today, Fraternity in Iraq has come back to one of the founding sites for its members. Our objective was to assess the damages as precisely as possible. As you know, Fraternity in Iraq has been committed to helping Mgr. Petros Mouché for several months, helping him rebuild Mar Behnam. A first appraisal brings the budget of this work site to 350.000 euros. We are going to look further into details with the Iraqi architects of Fraternity in Iraq and will keep you informed as soon as we have a better estimate. This site is as important to the Iraqi Christians as the Cathedral of Chartres is to French Christians. Help them protect their architectural heritage. Please make a donation !